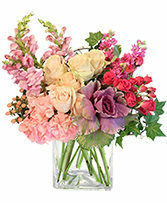 This bold pink vase is the perfect way to celebrate ! 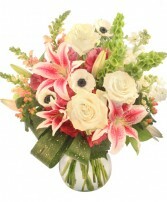 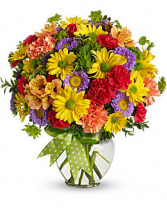 Hand-arranged with a vibrant bouquet, it's a gift she'll never forget! 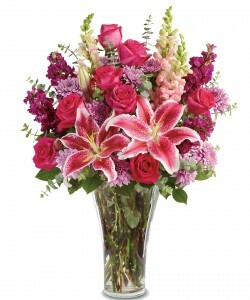 Stems of hot pink roses, pink stargazer lilies, burgundy stock, lavender cushion spray chrysanthemums, pink snapdragons, spiral eucalyptus and lemon leaf Hand-delivered!